MANLUKU is a non-for profit youth lead and Non-Governmental Organization aiming at providing opportunities that empowers young people to create positive change through Education, Agriculture and Health in Tanzania. Our main goal is enhancing and promoting good living standards to youth. It started as a company (Previousily MANALUKU Entertainment) before observing a great need for socio-economic empowerment to many youth in Tanzania. The association was regally registered in the year 2013 with the registration number 268098. MANLUKU is currently working in Tanzania mainland, with its head quarters at Kasulu district of Kigoma region - Tanzania, in youth's matters related to Promoting good leraning environments to children and adolescent youth, Livelihoods and WASH, Health & Nutrition. 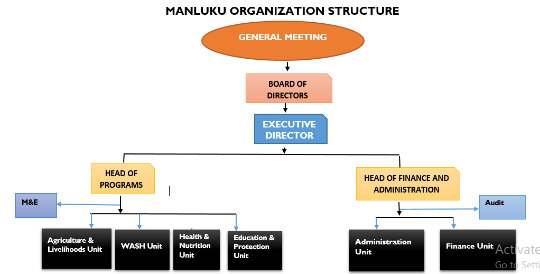 MANLUKU's vision is to be a center for sustainable social-economic development for youth through promotion of education, health and agriculture. Bringing together initiatives to build capacity, promote, enhance & sensitize youth on sustainable development, and ensure that the voice of a young person is heard across decision-making platforms.